"Sleeping 200 km above the Arctic Circle"
©Icehotel. This art room, created by Nikola Petkovic and Lile Sijakovi is called "Floating". The world-famous Swedish Icehotel in the village of Jukkasjärvi near Kiruna in Swedish Lapland was erected for the first time in 1989 and was the first ice hotel in the world at that time. It is a temporary structure built in November each year, melting down around April the following year. 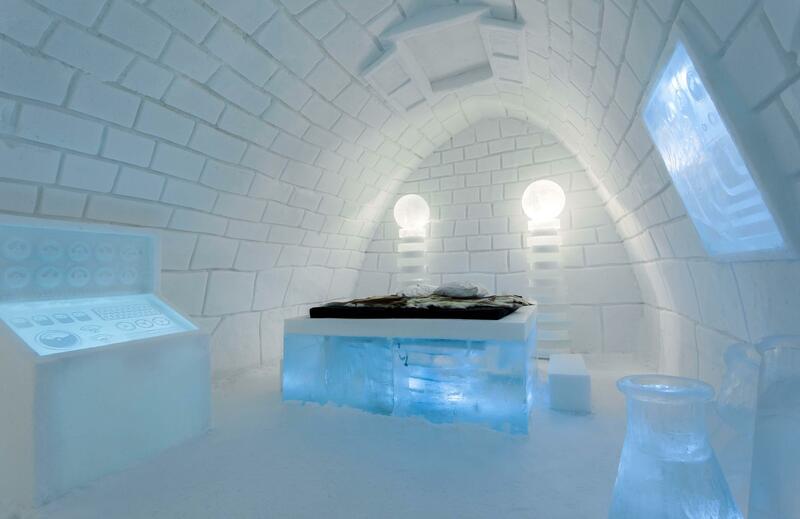 There are now several ice or snow hotels in the world, such as Sorrisniva Igloo Hotel in Alta (Norway), Snow Hotel in Kirkenes (Norway) and Lumilinna Snow Hotel in Kemi (Finland), but the one in Sweden is the world's first hotel made entirely of snow, ice and 'snice', a mixture of snow and ice. It has been built for 24 consecutive years now and will celebrate its 25th anniversary in January 2015. The Icehotel was initially built by a group of architects and artists, but nowadays Creative Director Arne Bergh works with his own team of designers. The hotel is situated in Jukkasjärvi, a small village 200 km above the Arctic Circle. It is easy accessibleby plane, either via Stockholm to Kiruna Airport, or directly from Heathrow London to Kiruna Airport. 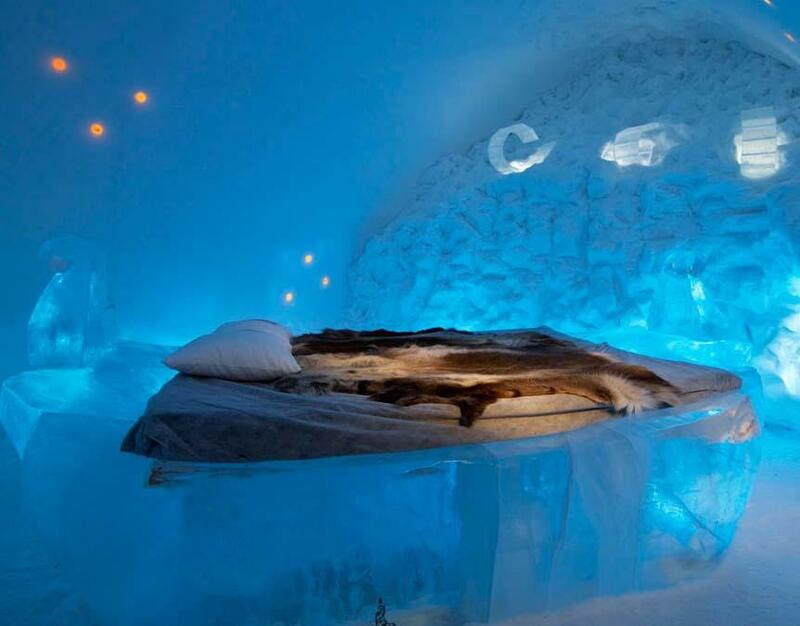 Guests can travel the 17 kilometres to the Icehotel by bus, taxi or dog sleigh. Kiruna is the northernmost town in Sweden, and is world-famous for its huge iron industry. The city of Kiruna was founded in 1900 and quickly became a major centre of iron ore extraction and mining. It now has the largest underground mine in the world. It also has a space centre under the authority of the European Space Agency, which was established in 1964. "Kiruna has the largest and most modern iron ore mine in the world, with a workforce of 4000, " says Arne Bergh. "Its production accounts for 90 % of the European iron output. The Icehotel organizes daily tours to the mine. It is a very interesting place to visit." A visit to the Icehotel also offers an opportunity to view the fascinating Northern Lights. Creative Director Arne Bergh: "I came here in 1993 and I was struck by the beauty of the river Torne which produces the best ice you can find." Sculptor and Creative Director Arne Bergh of the Icehotel in Swedish Lapland, is carving an ice sculpture on the banks of the river Torne. "Ice is a precious diamond"
When Creative Director and partner/owner of the Icehotel, Arne Bergh (64), came to Jukkasjärvi in 1989, it was as if he was 'frozen' to the river Torne. Struck by the beauty of the idyllic landscape and the purity of the most northern river of Sweden, the Torne, which he describes as a "magnificent river that produces rarely seen clear water", Arne cannot hide his admiration for this type of splendid natural platform, all covered with virgin snow. He feels privileged to live and work by this river and, as he once said "to even get my salary out of the ice from the river." Arne: "Ice is a precious diamond which gives us the opportunity to stop time, by storing ice blocks in March and start working with them again on the 1rst of November to build the Icehotel. We live in the cycle of nature: we build a hotel, every year, and the next year, after five months, it melts down. The Icehotel is born out of the river and goes back to the river." Arne Bergh has no problem with this kind of ephemeral art. On the contrary: "Every year we want to make new art and new designs for the Icehotel. That is always a challenge," he states. Some 50,000 visitors from all over the world come to stay in the Icehotel each winter, to experience the tranquility and the magical Northern Lights and to enjoy all of the activities offered in Europe’s last wilderness. The Icehotel covers 5,500 square metres and is constructed from 1,000 tons of River Torne ice blocks and 30,000 tons of 'snice', a mixture of snow, ice and ice particles mixed with air, that reinforces the structure. The construction of the hotel is a year-round process. 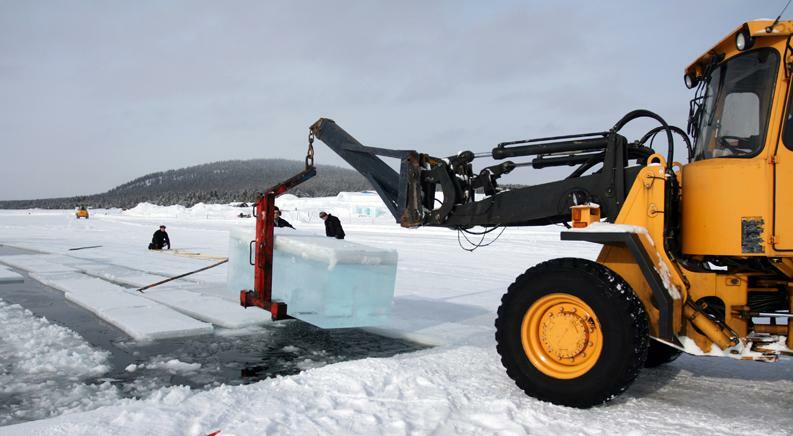 Five thousand tons of ice are harvested from the River Torne between March and April, and kept in cold storage during the rest of the spring and the summer. The picture on the right-hand side shows the ice harvesting process in March. Tractors lift about 2,500 ice blocks from the River Torne and transport them to cold storage, where they are kept until needed. Construction of the Icehotel, which is situated on the banks of the Torne, starts in November. "We can use the ice blocks for a whole year," says Arne Bergh, "and then there is a new harvest next spring. We harvest in the springtime because the ice has reached its maximum thickness of about 1 metre by then." Arne Bergh has been the Creative Director of the Icehotel for about 16 years, and really feels at home in this world of ice and snow. "I set up my own sculpture studio in Uppsala when I was 30, after graduating from the Stockholm University College of Arts, Crafts and Design. I worked mainly in wood. I have done a lot of projects for museums and schools, and I also made sculptures for the Vasa Museum in Stockholm. Coincidence brought me to Jukkasjärvi. When I saw the beautiful clear ice in the River Torne, I realized that this was a material I could work with." In 1989 the Icehotel was built for the first time. It was initially intended as an exhibition space, just a number of paintings hanging in an igloo, but the idea of turning the space into hotel gradually developed. Now the Icehotel has a global reputation. At this moment the Icehotel has grown into a company with a big staff, and we invite 40 artists from all over the world to design and decorate rooms for the hotel each year. ©Icehotel. Design "It's Alive" by Karl-Johan Ekeroth and Christian Strömqvist. Photo by Christian Strömqvist. It takes about eight weeks to finish the construction of the hotel. The artists arrive at the end of November, and start creating the various rooms. "The Icehotel is built in sections," explains Arne Bergh, "and the artists work on the various sections in shifts. Most of them work in pairs." During the final week before the hotel opens, all 40 artists spend time in the hotel together. The place simply oozes with creativity, though it still looks like a building site. Artists and technicians share the space among ladders, planks, wires, saws, cranes, shovels and wheelbarrows. Each room is filled with the right amount of snow and ice, using a cutting list and calculations based on artists' drawings. Eigth weeks later the Icehotel is ready, and it's not just a building but a real work of art. The rooms and hallways are built in a classic oval shape, which is the strongest structure due to its self-supporting nature. This is especially noticeable when the hotel melts - instead of collapsing, the roof and walls just become gradually thinner until the sun shines through. The Icehotel opens its doors to guests in December. During the following four months the hotel and art exhibition will attract around 50,000 people from around 80 different countries. 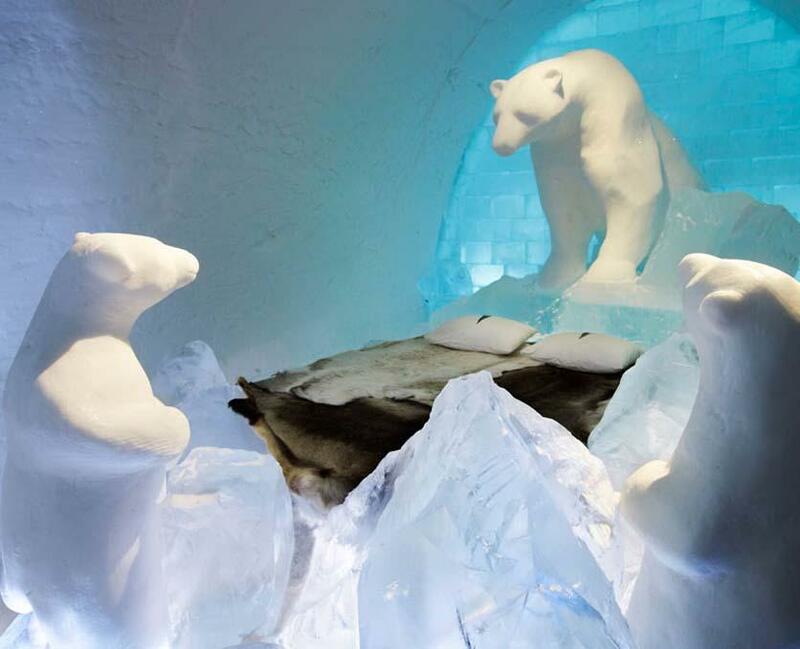 The Icehotel offers its guests both winter and summer accommodation. 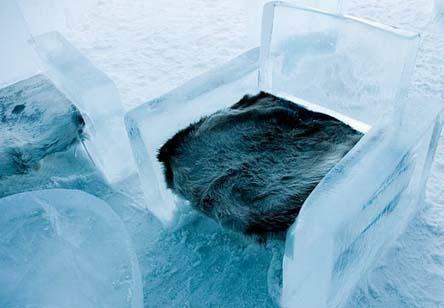 The Ice Rooms are comfortably furnished with furniture made of ice. ©Icehotel. This art room is called 'Arktikos', and is created by AnnaSofia Mååg. Arne Bergh: "Working at temperatures of minus 40º C is pretty tough." To get the hotel ready in time, Arne Bergh works with a team of sculptors, designers and architects. They have a wonderful time in the midst of splendid natural surroudnings. Designing and building the hotel can sometimes be easy, but sometimes quite hard. Arne explains: "It is only 5 degrees below zero at the moment, which feels quite warm to us. But we also have long periods when it's 40 degrees below zero and then it is hard to work. You can't work fast at those low temperatures and there can be many other problems too - but we specialize in problem-solving. We have to live with the consequences of the weather. Snow and ice are very plastic, renewable materials, that can easily be replaced. We have the ice and can always get more. It is a good building material. The average temperature during those months is 15 degrees below zero, which is perfect to work in. We have a total of about 65 rooms in the cold area, 16 of which are art rooms. One of the main problems in the Icehotel is the lighting. That involves providing electricity to the whole 5,000 square metres of the building. All the cables have to be out of sight, so we hide them away inside the walls. Of course we have to wear special clothing, and so do our guests. We provide them with snowmobile overalls during their stay here, otherwise it would be too cold. We have a cold area and a warm area. Most of the time people stay one night in the cold area and 2 or 3 nights in the warm area. We have two restaurants outside the Icehotel, but inside we have an Icebar, also made completely of ice. The art rooms are used for display purposes in the daytime, and at night they are turned into hotel rooms. Our guests are very enthusiastic. Also the computers work fine, they like it, they love low temperatures! But the most important thing is that I want people to think of the Icehotel as a place where they can go and see art and design. That is our main objective." 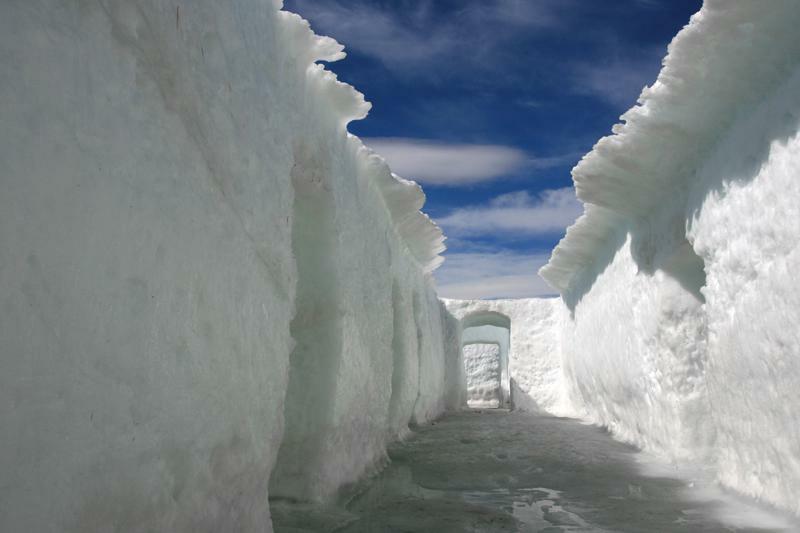 The Icehotel is famous around the globe, with its ice walls, its beautiful art, even furniture of ice, made from clear ice and the sublime scenery. It offers its guests a number of adventurous excursions, and a stay at the hotel is a true Arctic experience: there are snowmobile safaris, dog sleigh tours, reindeer safaris, an overnight Husky excursion, special ice sculpting lessons with professional guidance by famous ice sculptors, Northern Light tours. There is also a sauna and guests who like a challenge can enjoy an ice hole bath. The Icehotel also organizes fishing, boating or canoeing tours in the summer. 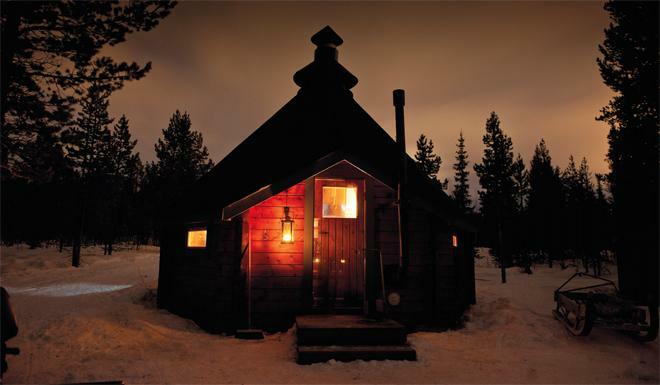 Wilderness camps are the perfect way to explore the vast expanses of Swedish Lapland. Scattered along the beautiful banks of the River Torne, the camps are fully equipped with a kitchen and a sauna. An optional camp host prepares meals for individuals and groups. In the summertime, the Icehotel organises rafting trips or hiking tours to explore the wilderness on foot. Guests can even enjoy a moose safari on horseback. It is however highly advisable to be properly clad for the Arctic and to wear multiple layers of clothes to stay warm. 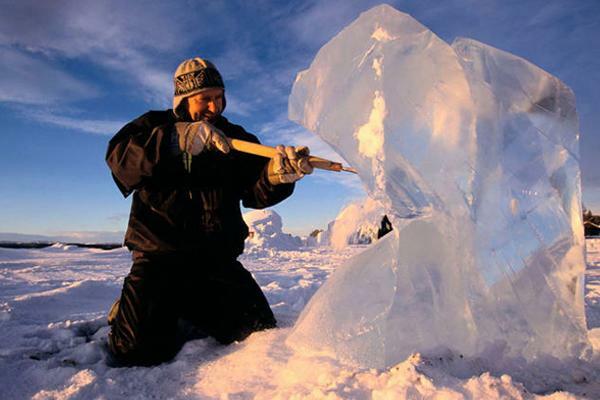 Arne Bergh has to devote his time both to managing the Icehotel and - every now and then - to making ice sculptures. However, the job of Creative Director is very time-consuming and leaves him very little opportunity to sculpt in ice. "If I have the time I am also going to sculpt a room, like the Northern Lights Suite, which I designed last year. I have done the design for that room. which was then created by different artists in ten identical units. Managing the Icehotel takes a lot of time, but I think it still is important to be an artist. I also have the opportunity of traveling with the ice, because we are having events in other countries. For example, I went to Cape Town in 2012, where we reconstructed a part of the entrance hall of the Icehotel for a foto shoot." In December 2013 Arne Bergh combined forces with Brazilian street artist Speto, bringing South American hot rhythms to the Icehotel. They worked together for two weeks on an ice sculpture called 'Todo Mundo' ('The whole world').